John 14:28 …If ye loved me, ye would rejoice, because I said, I go unto the Father: for my Father is greater than I. 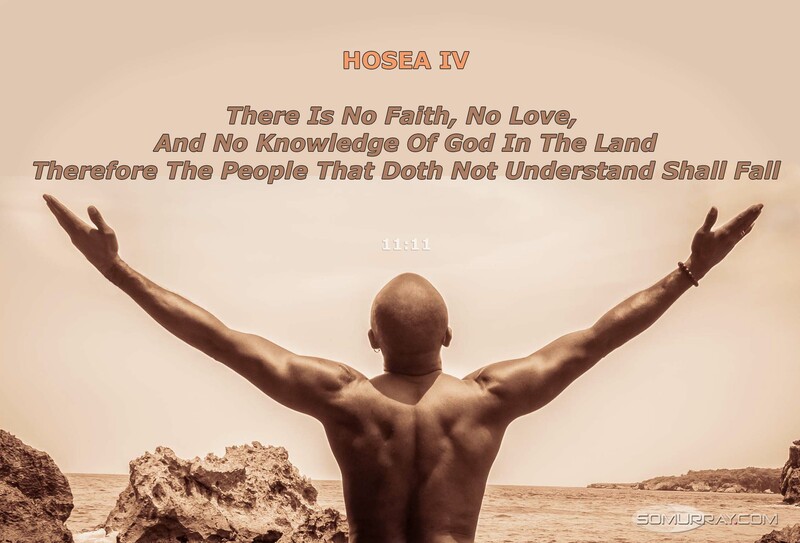 Why worship him when he clearly proclaimed that his Father is greater? Matthew 6:9-13 After this manner therefore pray ye: Our Father which art in heaven, Hallowed be thy name. Why pray to the him when he asked us to pray to our Father? 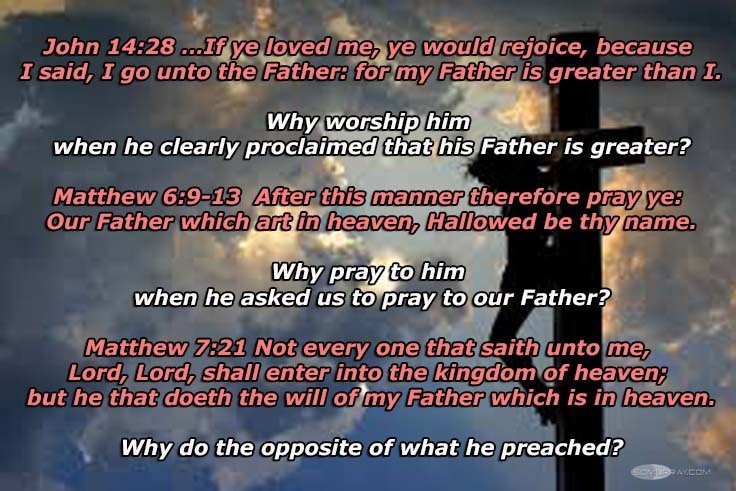 Matthew 7:21 Not every one that saith unto me, Lord, Lord, shall enter into the kingdom of heaven; but he that doeth the will of my Father which is in heaven. Why do the opposite of what he preached? 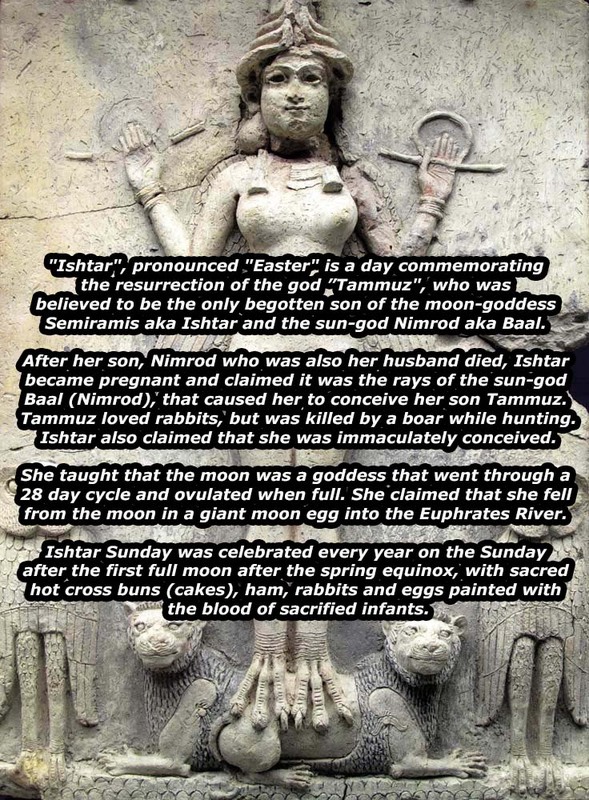 "Ishtar", pronounced "Easter" is a day commemorating the resurrection of the god ”Tammuz", who was believed to be the only begotten son of the moon-goddess Semiramis aka Ishtar and the sun-god Nimrod aka Baal. After her son, Nimrod who was also her husband died, Ishtar became pregnant and claimed it was the rays of the sun-god Baal (Nimrod), that caused her to conceive her son Tammuz. Tammuz loved rabbits, but was killed by a boar while hunting. Ishtar also claimed that she was immaculately conceived. She taught that the moon was a goddess that went through a 28 day cycle and ovulated when full. She claimed that she fell from the moon in a giant moon egg into the Euphrates River. Ishtar Sunday was celebrated every year on the Sunday after the first full moon after the spring equinox, with sacred hot cross buns (cakes), ham, rabbits and eggs painted with the blood of sacrified infants.